On Saturday, September 10, in lieu of pre-assembly scattered meetings, members of Franconia Conference were joined by their sisters and brother from Eastern District Conference at Franconia Mennonite Church for a morning of dialogue and discernment around the topic of promises and practices. This dialogue was led by David Boshart, moderator-elect of Mennonite Church USA (MCUSA) and executive conference minister for Central Plains Mennonite Conference. Rekindle the gift of God’s grace that has made us alive through the power of the cross of Jesus. Keep the good works for which we have been created in proper perspective. 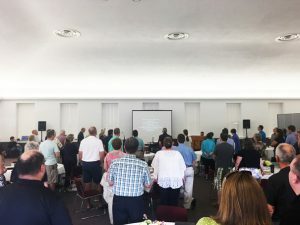 David demonstrated how often the church seems to work out of a more contractual relationship, standing face to face, looking to Jesus on the side, rather than a covenantal relationship, standing shoulder to shoulder, looking at Jesus. 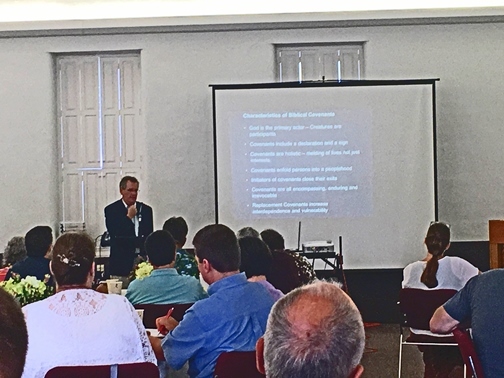 He also spoke of his own conference, Central Plains, and their search for unity, mentioning that they have asked themselves, “is it possible to find our unity in common spiritual practices?” From that, they went on to develop A Covenant of Spiritual Practices. How might understanding our relationships within the denomination as covenantal be a gift to us rather than a burden? How do our expectation for one another change when we move from face to face orientation where we are the negotiators to a shoulder to shoulder orientation where we are all trying to draw closer to Jesus? Following the morning session, credentialed leaders and those pastoring Franconia Conference congregations were invited to stay for further giving and receiving counsel on relationships between congregations, conference, and MCUSA. 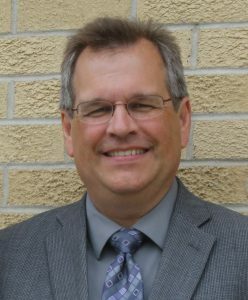 This came as a request from the conference board who was seeking counsel and wishing to hear the perspective of Franconia Conference credentialed leaders and those pastoring the conference congregations. To hear the full audio of David Boshart’s presentation and view his PowerPoint, visit: http://franconiaconference.org/media/audio-gallery/.